La Travesía Anual — Annual Community Swim from Playa Norte to Deer Island, Mazatlán | ¡VidaMaz! See those islands in the background of the photo above? Want to swim to the one in the middle, Isla de Venados/Deer Island? Think you can do it? It’s only 5.6 KILOMETERS of ocean swimming. Takes the average swimmer two to four hours. The best time in 2012 was ONE HOUR 20 MINUTES! Every year on the first Sunday in November members of Mazatlán’s swim club (Club de Natación Playa Norte) do that very swim. This past November over 200 of them participated in this most wonderful Travesía Anual! Among the 200 swimmers who completed the event was an eight year old boy named José Luis Zazueta. I had the pleasure of interviewing Luisito this morning, along with his father (also Luis, a computer technician) and his swim teacher, Lourdes Ortega. Click on any of the photos below to view them larger and read the full captions. Luisito Zazueta, at eight years old the youngest boy ever to complete the Travesía Anual, the 5.6 km swim to Deer Island, behind him in the photo. Closeup of Luis’ too-cute toothless grin. Lourdes (Lulu) with a few of her students. She runs a swimming school in Via Galaxia. Luis Senior enrolled Luisito in lessons at a pool run by Lourdes, out where they live in Via Galaxia, when the boy was five years old. Luisito took to the sport so naturally that he graduated from Lulu’s small pool to the larger swim program at Montfort. In only three years’ time Luisito was able to develop the technique, strength and endurance to complete the Travesía Anual. During the event Dad rode in a kayak beside Luisito, and had to stay at least 10 meters away from his son at all times. The swim club people are very open and inviting. Knowing of my interest, they invited us to their Christmas posada, which we were unable to attend, and then again invited Greg and I to attend this month’s competencias, during which everyone who wants to swim and get timed can do so and track their progress from the month(s) before. We met people from 7 to 70+, all happy and fit as fiddles. We met triathletes, multi-generational families of swimmers, groups of friends, and people who’d been swimming in the bay for over 50 years! What a good-natured bunch of interesting people! Click on any of the below to see a slideshow or captions. 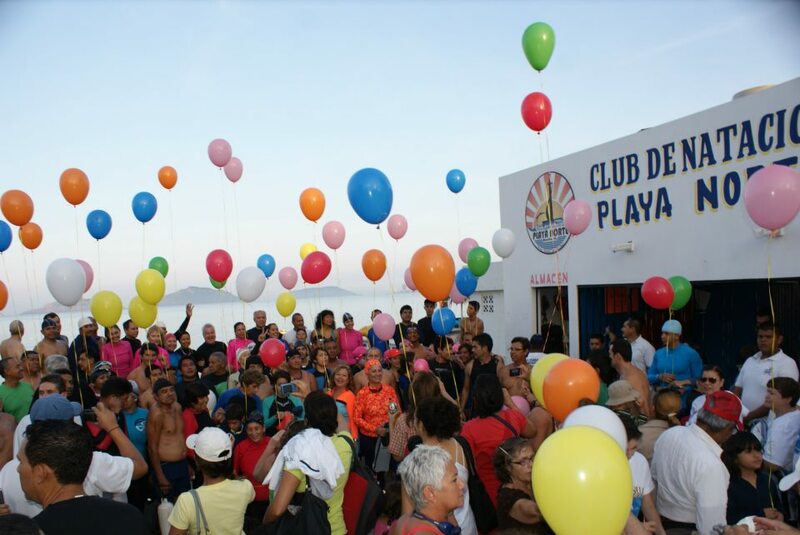 And adults of all ages..
What is the Club de Natación Playa Norte? The Club de Natación Playa Norte is one of Mazatlán’s oldest and most organized community groups. It will celebrate its 30th anniversary in 2013! You see the clubhouse on the beach in Playa Norte, just north of the gymnastics equipment and the skateboard park. We have walked by the club nearly every morning for five years, and at that early hour of the day it’s always a hotbed of activity and excitement. We’ve noticed the man holding the keys on a board of hooks, the people milling around in wet swimsuits, someone eating ceviche for breakfast, some people showering… Click on any of the photos below if you’d like to see them bigger, see the captions or slideshow. Amazingly and fortunately for Mazatlán, this “little club” puts on TEN monthly competitions, an Aquatic Marathon (in September), and two big travesías in addition to the Travesía Anual a la Isla de Venados. The club is incredible. It is run by an elected Comité. The Presidente for the past three years has been Martín, the man with the stop watch in the photos. The club originally started as a cycling club at a location further south, and evolved into the swim club at its current location. Annual dues are only 200 pesos. For that amount you receive an identification card, and you are welcome to use the facilities (including toilets and showers) as often as you wish. Your backpack of things and your car keys are watched over by Pancho, who welcomes members’ tips. The deal is that you show up in the early morning, ready to swim. If you don’t show; no worries. If your teacher isn’t there, someone else will help you. If you’re an experienced ocean swimmer, you teach someone newer to the sport. The club seems to be quite the idyllic self-organizing system! We observed that young children are closely supervised by older swimmers, both teenagers and experienced adult teachers. Among the many local swimmers this morning we also met two extranjeros: Fran Ittner, from Minneapolis, who has been part of the Club de Natación since 2000 (and has wintered in Mazatlán for 26 years), and “Tío Sam,” a most interesting South Korean gentleman who has lived in Mazatlán for three years. Fran told us that if you want to learn more about the club or the Travesía, just drop him a note. Each year members select one person to be honored for their assiduous participation in the club—and they name that year’s Travesía Anual after them. In 2010 it was named after Lulu, Luisito’s swim teacher. So What Was the Event This Morning? As I said, ten times a year the club conducts competencias, or trials, which we observed this morning. Since the Triathlon is next week, there were a few more participants than usual this morning, I was told. Club members who wanted to participate in the trials showed up just before 8:00 am. They registered and received a t-shirt. They had a number written onto their upper arms. Today’s participants lined up for an official photo. Then a new triathlon team from ETI had their photo opp. After everyone stripped out of their official t-shirts, the adults lined up for their trial. Three buoys had been set out in the ocean, and Martín gave instructions that swimmers were to make a loop around the outside of the three buoys. A couple of the guys interpreted for Fran, so he would know the route. One of the men we met went out in a kayak to supervise, ready to provide emergency assistance if needed. Participants swam only one lap around the buoys today; we were told this was because the water is still so cold. There were quite a few people standing around who didn’t swim today, and told us they only swim from April, when the water is warmer. After the adults, next up were the young children, 7-10 years old or so. There were only two buoys for the kids’ trial, and they were brought in closer to shore. Martín assigned a strong teenaged swimmer to each of the younger children, and instructed them to stay close by in case the younger ones needed help. What a way to build responsibility and community! Then the kids were off. There were some tears shed at the conclusion of this trial, because the youngest swimmer lost a tooth while he was out. He was heartbroken, because he was afraid the ratón wouldn’t bring him money since he didn’t have the tooth that had fallen out! It was just too cute. While the Club has well over 100 members, today there were far more observers than swimmers, I think. Grandparents, parents, cousins, friends—whole groups showed up to cheer on their friends and family members. There were some women selling food and drinks: fresh fruits and cut vegetables, sandwiches, bolillos, cake. The Club itself had a crate of bananas and a bunch of bottles of water for all the participants to snack on after their heat. It was a fun social event. I urge you, if you’re at all interested in swimming, to give the Club a try. If you want to take lessons or get involved, the best way is to show up at the clubhouse, ideally in the morning around 6:00 or 7:00. At the least, visit them for their next competencias. The group has a Facebook page that is administered by Rogelio Fontes, but Rogelio tells me he only logs in to upload photos, as he’s not a big Facebook user. To get an email response you can contact natacion.playanorte@gmail.com, or Rogelio’s office telephone is (669) 913-4900 (he speaks perfect English, graduated from UC Berkeley). 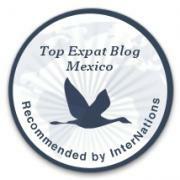 Pingback: The Best Views in Mazatlán | ¡VidaMaz!